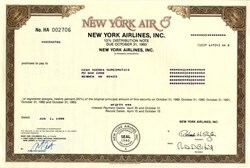 Beautiful uncancelled stock certificate from New York Airlines Inc issued in 1989. This historic document was printed by the Security Columbian Banknote Company and has an ornate border around it with a vignette of the company's name and apple logo. This item has the printed signatures of the Company's officers. This is the first time we have had this certificate for sale. New York Air was a 1980s startup airline owned by Texas Air Corporation and based at Hangar 5 at LaGuardia Airport in Flushing, Queens, New York City. It ceased operations on February 1, 1987, in a merger with Continental Airlines. Founding New York Air president, Neal F. Meehan, had been a senior manager at both Continental Airlines and at Texas International Airlines (TI). In September, 1980, he assembled a team of airline managers; within 90 days it had hired, trained, uniformed, and drilled New York Air's flight crew, flight attendants, dispatchers, terminal, ramp and reservations personnel. Office and maintenance facilities in the hangar which had originally housed American Airlines headquarters at LaGuardia in the 1930s were thrown up rapidly, and the carrier obtained FAA certification as an adjunct to TI's certificate. In one notable vignette, New York Air managers interviewed over a thousand candidates for flight attendant, reservations, and airport jobs in one day of group interviews held at New York's famed Town Hall Theater, in November 1980. The Airline Pilots Association (ALPA) pilots' union fought New York Air vigorously, running picket lines at LaGuardia and Washington National and taking out critical ads in the New York newspapers. Suspected acts of vandalism, interference, and prohibited aircrew operations were also reported by New York Air flight crews and managers. New York Air's representatives to the Airline Scheduling Committees (CAB-authorized committees of airline representatives that allocated takeoff and landing slots at capacity-controlled airports in New York, Washington, and Chicago) were stonewalled for months as they sought to get the necessary 'slots' for New York Air to operate their shuttle services between New York, Washington, and Boston. Eventually, however, the airline succeeded in overcoming all obstacles. New York Air service commenced on 19 December 1980 with shuttle operations between New York LaGuardia, Washington National, and Boston Logan airports. A moribund U.S. economy and the Professional Air Traffic Controllers Organization (PATCO) strike badly hurt New York Air's first 15 months of operation. The strike particularly affected the New York, Boston, and Washington, the airports where NYA operated the majority of their flights. Passenger traffic began to build substantially in 1982 after President Ronald Reagan intervened against PATCO strikers, and the U.S. economy began to recover. A new CEO, Michael E. Levine, was brought aboard in 1982 to restructure the airline. Levine first shrunk NYA, then doubled it in size by 1984 at which time NYA was solidly profitable. Levine left NYA in the spring of 1984. At its operational peak, New York Air employed over 2,000 people before Texas Air combined NYA and other airlines they owned with Continental Airlines on February 1, 1987. The New York Air image and livery disappeared as NYA was integrated into Continental mainline operations during 1987, consolidating their New York operations to Newark-Liberty and moving their DC-9s and MD-80s to other hubs, including PTI (Piedmont Triad International Airport). New York Air was well known for its onboard bagged snacks, known as "The Flying Nosh."